You must make bookings at least 5 minutes in advance of the time at Salaam Namaste. 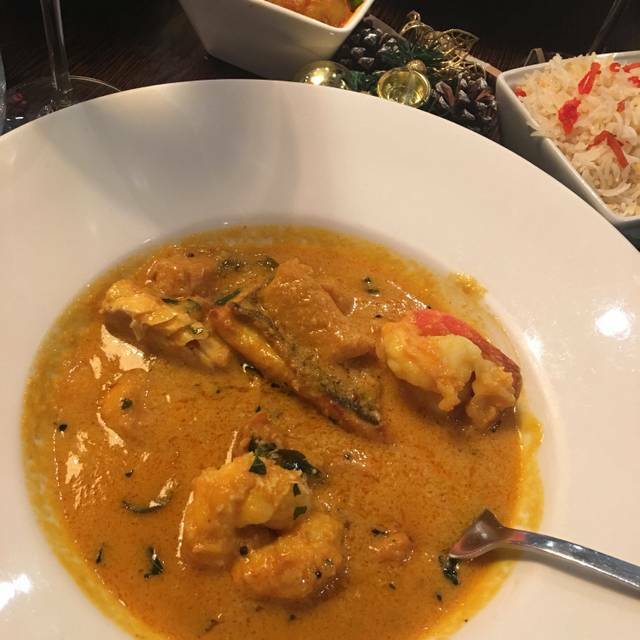 Located in London’s stylish Bloomsbury, Salaam Namaste has been serving the Indian food aficionados of the area for over 10 years and is at the forefront of Indian and Pakistani cuisine. Award winning chef patron Sabbir Karim has imparted his wealth of knowledge both behind the scenes in the kitchen and in the development of the menu. Dishes such as Crab Balchao and the Dhaba Gosht are particular favourites of the regular diners. Following a refurbishment in 2013, Salaam Namaste can cater for 70 covers at any one time and is an elegant and contemporary space for intimate dinners or an ideal venue for entertaining guests, business clients and private parties. Service was a little slow. Servers didnt seem familiar with menu. Food was mostly great. Had to order my drink twice. Good but not real fusion ... There are better places for to enjoy asian fusion . Though it is neat and clean but I guess the taste lacks that sparks.. won't be going never again. Great choice of food, very helpful waiters, and a nice atmosphere. Would go again. We tried dishes in both the new and traditional categories and thought everything was excellent. The service is friendly and very professional and the space is pretty. We will definitely return. Went with a friend to Salaam Namaste near Russell Square in London. The food and service was great and we really enjoyed our catch up. We used the 20% discount on food which made the experience even better. I will definitely recommend this restaurant and will also visit it again. Had late lunch with friends and so the restaurant was empty and so lacking in atmosphere. The food was very good and the service was excellent. The menu was a bit different from your standard Indian which made it more interesting for us. Was good value too with the deal. We booked Salaam Namaste after doing a bit research online. Overall we were extremely pleased and satisfied with our meal. The menu choice was very good with a range of different dishes as well as the more traditional ones. Also a good selections of wine, some reasonably priced. We really enjoyed both our starter and mains. Nothing to fault at all. Service was excellent. The manager Tushar Gupta was extremely attentive, asking us for feedback on how we found our meal and service. A great choice for us and we will be back again next time we are in London. I recommend the curries: The butter chicken And seafood moilee were absolutely delicious. The scallops and venison as starters were really enjoyable! The dessert though... the presentation made us think that iT might taste good but we were wrong.. the chocolate pudding With the brownie in the bottom was just weird. the halwa I ate here tasted Like it was scooped from a used spoon (I think wrong spices were used) Also the carrots wasnt grated but sliced in small pieces which ruined the whole dish :( I love halwa But This dissapointed me. Overall the place was cosy, hot and a bit crowded. The waiters were politie And very Well disciplined. The food was excellent. I had the green curry with Koriander and tamarindes. Beautiful dish. Meat used was also of nice quality. No chewy chunks of the chicken in it. 4,5 out of 5 stars for me! Great food and lovely place, quite fancy. Cocktails were really good too. Staff was really friendly and welcoming. We went on a Tuesday night so it was quiet. We arrived at the restaurant in time for our reservation, however, was so busy, was told to wait outside. Food - lovely, limited choice but food tasty. a bit on milder side. Dumpukht biryani was amazing. But Kathi roll tased more like tortilla warp. Great food , too long a gap between ordering and getting food- 20 minutes for started 50 minutes for main course. I tried a recommended starter from the staff that I have not had before. It was similar to a chicken chat but a drier consistency and was delicious . The chicken tikka madras was hot a full of flavour and the cobra beer cold and lively. The friendly , attentive staff made for a lovely experience. I will be returning on my next visit to London . We tried this restaurant on off chance after a show and were very pleasantly surprised. A small restaurant with good ambience. The food was delicious and flavourful especially the jinga peri peri and the Rajasthan Laal Maas. The service was good. Will definitely go back if in the area again. absolutely amazing food! highly recommend it. Not heavy or oily and right balance of flavours. Found this place after searching for a place for ages, thank god we did. We had a wonderful time. Food excellent, service was incredible, place busy and top atmosphere. We went mid-week at lunchtime and had the restaurant to ourselves. Everybody in our group said that teh food was excellent. Service was polite, friendly, and quick. The restaurant is tucked away from the high street, so it probably doesn't get much passing trade, but well worth going to. The appetizers were really good, but neither of us much cared for our main dishes. Flavorful, but heavy and not varied -- just meat or just meat and starch and no veg. Would have preferred the format of smaller main dishes so one could also order some vegetables. Quiet, nice atmosphere. No place to put coats, which in the middle of winter is a bit of a drag. Overall ambiance was good, however food was nothing special compared to some of the new modern Indian restaurants in London. We went for a meal for a leaving do, and there were 10 of us. The food was wonderful and all came at the same time (no one was forgotten). The staff were great and helped us with everything we needed. I would definitely recommend going! The food is very good quality and tasty. Service is friendly and helpful. The restaurant has a lovely, calm atmosphere - will definitely return again soon. This place is quite a gem. Really tasty food that is different from your average curry restaurant. Nicely upmarket, informal and relaxing. Great service. Been twice, having organised two parties of c10 people and get well looked after. We were placed near a door and wanted to Change places but the seats were not available as they were for other bookings. When the door was ope as people using the door you could feel the draft. The service was good. Ambience was ok. The food was good with good presentation. The Biriyani, we have tasted better. The prawn dish was excellent .The price was reasonable. 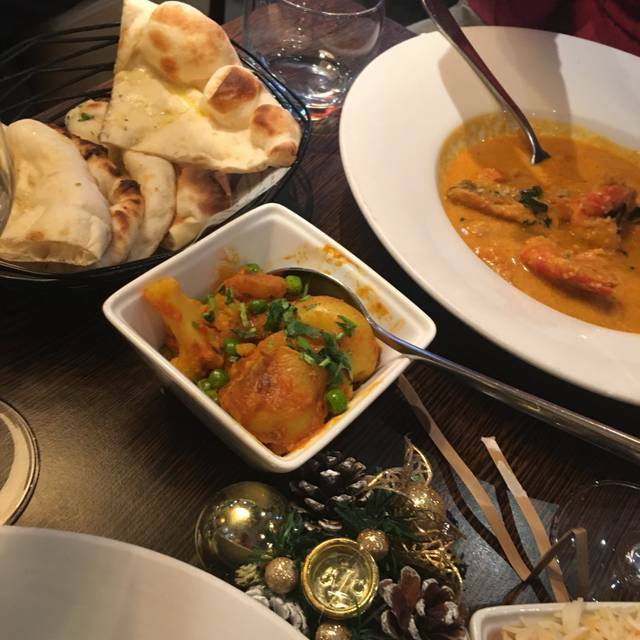 We enjoyed a fantastic night at Salaam Namaste- great service, delicious food, lovely ambiance. The quality of the food and variety of dishes was much appreciated by all the guests, and I am always happy to return to this restaurant for both business and pleasure. Superb cuisine, attentive staff. Tables a tad small and too close, hence losing a couple of stars. Nevertheless highly recommended. This was the second time i had been here in the space of a month. Excellent food and service. first time was for 2, this time for 8. All commented on the quality being top notch. Will be booking here again. I can not fault this restaurant, the waiters were absolutely amazing and the service was excellent. The food tasted lovely and was brought out without delay. Went here for a birthday and they provided a lovely piece of cake with a happy birthday message on it as a finishing touch. Lovely, I recommend everyone to try. Will be going here again. Visiting from Chicago and was looking for a Pakistani/Indian place for New Year’s Eve dinner. This is a bit outside of central London but a great experience. The hosts were very welcoming, a variety of dishes offered, and good tasting overall.